Kaleidoscope Jasper is a recent discovery. It is found in the Mitchell, Oregon area of the US. It is so named because of the many colors that show in the stone once cut and polished. This lovely piece of Kaleidoscope Jasper is further enhanced by the unusual curved shape of the finished stone. The stone is wrapped in a Sterling Silver bezel and finished off with a Celtic Knot on the bottom. This pendant is offered as pendant only and has a very generous bail to accept a snake or cobra chain form your collection. You could look at this stone for a long time and continue to see something in the swirls that you didn’t see before. Amazing! $210.00 including free shipping within the US. 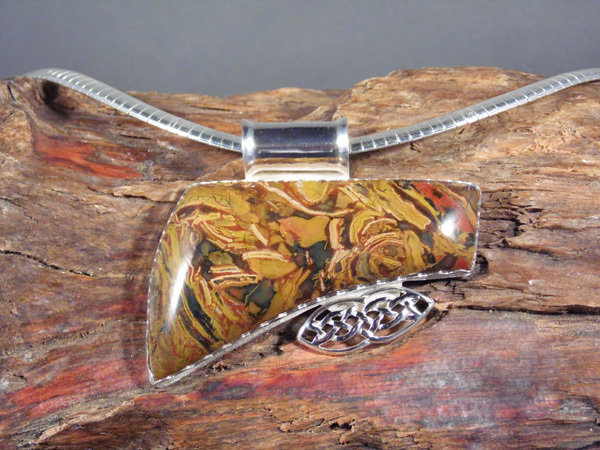 This Kaleidoscope Jasper Pendant in Sterling Silver is approximately 2 ” tall, including bail and 2 3/8″ wide.